Cirque Plume is performing in Paris until 20 December before touring throughout France during 2010 and 2011. 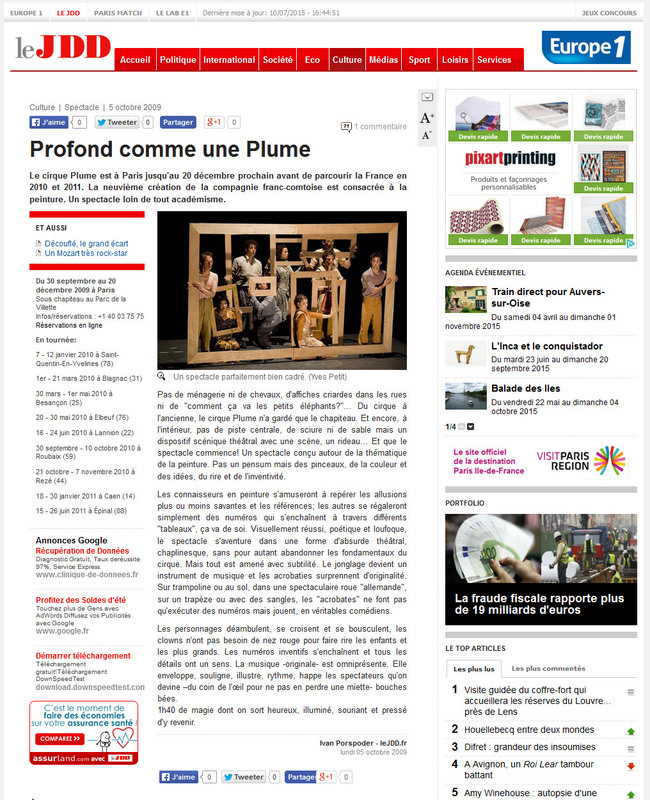 The ninth production by the company from Franc-Comté is devoted to painting. It’s a show that is anything but scholarly. No wild animals or horses, garish posters in the streets or "How are we, kiddywinks?". The only bit of the traditional circus that Cirque Plume has kept is the big top. But even there, on the inside there’s no main ring, sawdust or sand but a theatrical stage setting with a stage, a curtain… Let the show begin! A show conceived around the notion of painting. Nothing heavy, just brushes, colours and ideas, laughter and inventiveness. Connoisseurs of painting will have fun spotting allusions and references, some more learned than others; the rest of us will simply enjoy the acts that are strung together in a series of ’paintings’, naturally. Visually splendid, poetic and madcap, the show strays into the theatre of the absurd, Chaplinesque, but without abandoning the basics of the circus. But everything is done with great subtlety. Juggling becomes a musical instrument and the acrobats are amazing in their originality. On the trampoline or on the floor, in a spectacular ’German wheel’, on the trapeze or with straps, the "acrobats" don’t just perform their routine, they act like real actors. The characters stroll around, pass by each other and knock into each other, the clowns don’t need red noses to make the children and adults laugh. The inventive routines follow on from each other and every detail is there for a reason. The music -original compositions- is omnipresent. It envelops, emphasises, illustrates, adds rhythm, enthrals the audience who, if you steal a glance so as not to miss anything that’s happening on stage- are watching open-mouthed. 1 hour 40 minutes of magic that leaves you happy, enlightened, smiling and longing to return.